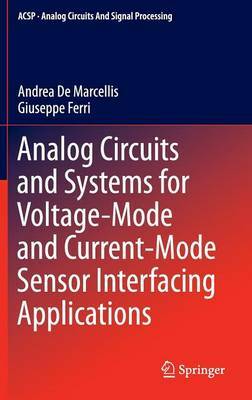 Analog CMOS Microelectronic Circuits describes novel approaches for analog electronic interfaces design, especially for resistive and capacitive sensors showing a wide variation range, with the intent to cover a lack of solutions in the literature. After an initial description of sensors and main definitions, novel electronic circuits, which do not require any initial calibrations, are described; they show both AC and DC excitation voltage for the employed sensor, and use both voltage-mode and current-mode approaches. The proposed interfaces can be realized both as prototype boards, for fast characterization (in this sense, they can be easily implemented by students and researchers), and as integrated circuits, using modern low-voltage low-power design techniques (in this case, specialist analog microelectronic researchers will find them useful). The primary audience of Analog CMOS Microelectronic Circuits are: analog circuit designers, sensor companies, Ph.D. students on analog microelectronics, undergraduate and postgraduate students in electronic engineering.